We got out of Springfield nice and early Tuesday morning, traveling north on Highway 287 through a land of grain fields and giant, tri-blade wind turbines. We’d seen similar turbines on our first day in eastern Washington, but there was something more impressive and mighty about the ranks of these massive wind machines marching across the Colorado flatland where the next tallest structure was a two-story farmhouse. Within forty-five minutes we hit Lamar and immediately realized my instinct had been on the money and we should have pushed on to here the previous night. Lamar is a much bigger town than Springfield and would have afforded us more choice in motels and restaurants. I didn’t regret our evening in Springfield, but if you’re ever traveling through this area and want a larger playing field for your touring dollars, Lamar will offer you more. In Lamar we finally left 287, striking west on Highway 50 for a pleasant drive through more farm and ranch country. 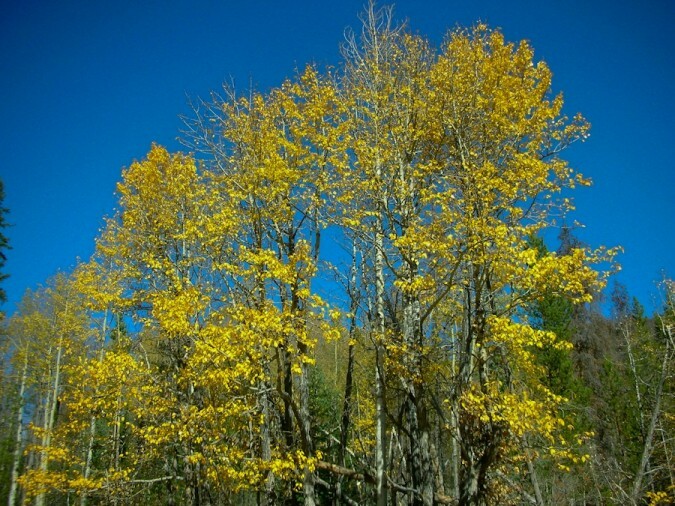 We passed Los Animas, La Junta and many other smaller towns, as well as countless fields full of cattle, hay bales, and aspens shimmering golden in the autumn wind and sunlight. Along this stretch we also encountered one of the most amazing sights of our entire trip, and not one you’ll find on any tourist map or could plan on seeing. At first there were only a scattered few of them, but soon I noticed more and more small bits of lightly colored something-or-other floating around like confetti. I thought perhaps they were some sort of petals blowing off the trees, but in September? Then I realized they weren’t floating, but flying in erattic, haphazard patterns, and they weren’t bits of paper or tree blossoms, but butterflies or moths. I still don’t know which. Soon they flew even thicker, until it looked like a snowstorm of small, pale bluish-green snowflakes dancing in the sunshine. This lasted not for just a minute or two, but a good fifteen minutes, and they were everywhere: in the air, on the ground, the road, dashing themselves against our windshield. While we never really solved the mystery, this stretch of Highway 50 parallels the Arkansas River, and I have to assume this was some sort of massive annual wetland hatching and we just happened by at the right time. Better to be lucky than good. We soon hit Pueblo and jumped onto I-25 heading north for Colorado Springs and Denver. 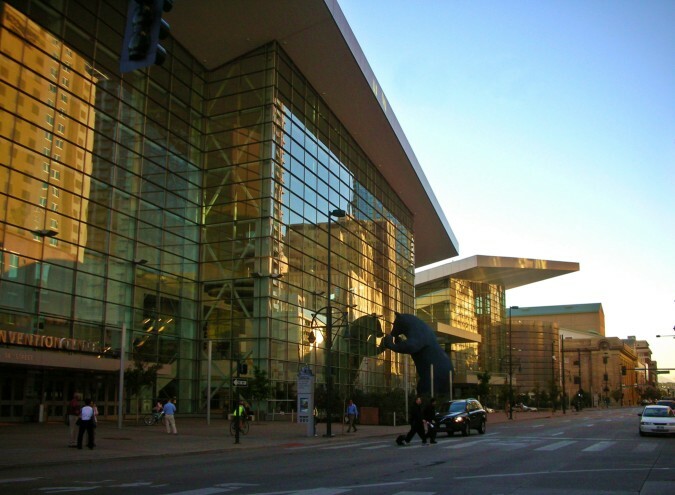 Colorado Springs is a beautiful city in a scenic natural setting with the Front Range and Pikes Peak to the west of town, and so many things to do and see in the area that it would – and does – make a vacation destination in itself. In fact, the city was actually founded in 1871 by General William Palmer with the express intention of creating a high quality resort community. To say he succeeded is an understatement. We were only passing through, however, with enough time to choose one thing to see from among the many: Pikes Peak, the Air Force Academy, Garden of the Gods, Seven Falls. On the recommendation of a friend we chose to visit Seven Falls. Ordinarily I shy away from these sorts of privately owned tourist traps, case in point our previous year’s trip down the Oregon coast and wasting our time and money on a stop at the Sea Lion Caves. But this one turned out much better, with only one small caveat. The drive into the Falls is a breathtaking, if brief, journey through one of the most impressive box canyons I’ve ever seen. Sheer rock faces and defiles shoot up and hem you in on every side as the road winds and curves deeper into Cheyenne Canyon. Then you park and pay your nine bucks per person and walk on in. There is, of course, the inevitable gift shop full of the usual gewgaws and knickknacks, but we bypassed that and headed straight for the top. A dizzying, 224 step staircase ascends along one side of the falls, and is not recommended for acrophobiacs. If you either don’t want to or can’t handle the stairway, there is an elevator available which will take you to a nice viewpoint looking across to the falls on one side and a grand view of Cheyenne Canyon in the opposite direction. Irina isn’t crazy about heights, but gamely climbed the steps with me. We took our time going up, stopping for pictures and eventually reaching the top. The weather was great, sunny and warm with a nice breeze, the view stunning. Only one teensy little problem. Seems we’d come at the wrong time of year, and the falls had about as much water coursing over the rocks as a leaky faucet might produce. A group of college frat boys could have stood at the top drinking beer and generated a bigger flow by peeing in the stream. Well, life isn’t perfect, so when we got to the top we took a short nature walk through the trees and enjoyed that. We descended the steps, which for Irina was much worse than going up. 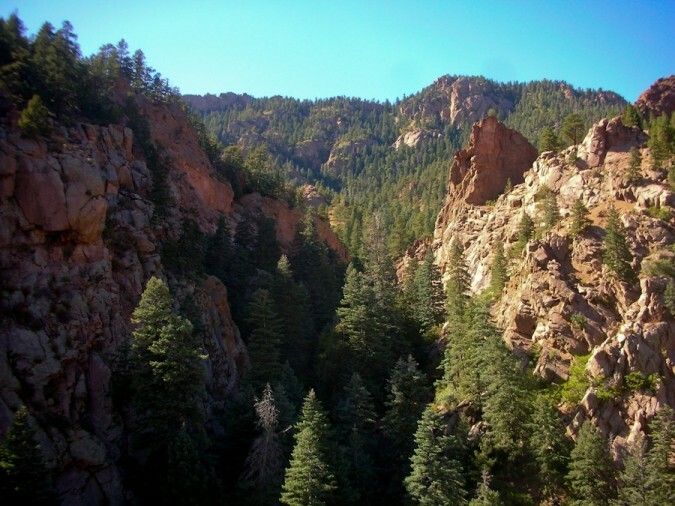 Then we spent a little time in the gift shop, rode the elevator up to the viewpoint and down again, and said goodbye to Seven Falls and Colorado Springs. Next stop, Denver. Coming into Denver from the south on I-25 we hit the worst traffic of our entire trip, which was unsurprising given the size of the city and the fact we arrived just in time for afternoon rush hour. Not the best way to introduce yourself to a major metropolitan area. We managed to grind our way through without getting completely lost and found our way to the motel we’d chosen, a La Quinta Inn located just off I-70 on Peoria St. in the Aurora area east of town. Not a great location but a decent room at sixty bucks, which I’d rate at three and a half stars. After settling into our room, we headed into the city itself via Colfax Avenue. I’d looked at a map and saw Colfax as a major thoroughfare shooting straight west into the heart of downtown, and so chose this as a way to see the city at street level rather than by freeway. Boy, did we ever. In retrospect I’d now go a different route, like, um, by freeway maybe? I won’t say I regret the decision, but Colfax was time consuming and not exactly going to be designated as a scenic drive any time soon. There is a stoplight literally every block, all of them red, and the entire length that we drove is commercial, and low rent commercial at that. Parts of it were downright scary looking, the sort of neighborhoods that make you check if your car doors are locked. I kept looking around expecting to see a film crew shooting an episode of Cops in Denver. Shortly after passing the State Capitol building, we finally reached the downtown area right at sunset. We found a spot to park on the street without much trouble, a fact I found amazing after years of trolling downtown Seattle streets futilely searching for the same. We had a great couple of hours just strolling around the streets with absolutely no agenda or timetable. 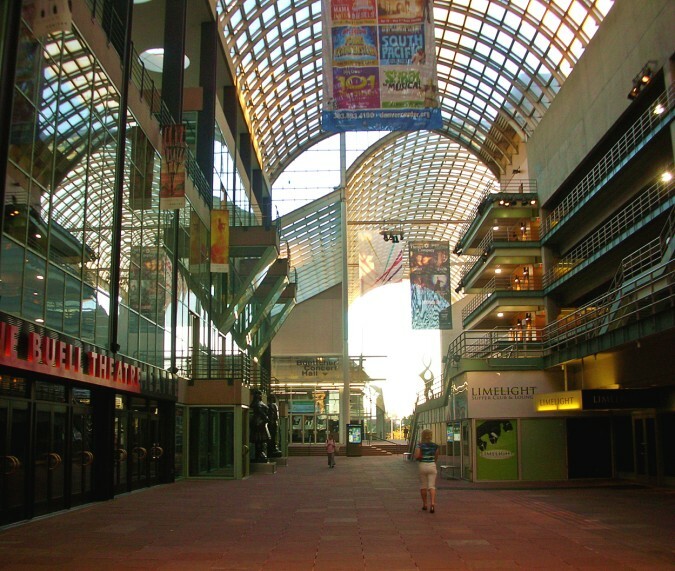 We looked in at the Convention Center, and wandered through the Denver Center for the Performing Arts, a huge complex that covers several city blocks and contains their Symphony Hall, Opera House, a live theater hall, and a cinema multiplex. A few blocks away from that we found a delightful street which had been cordoned off for pedestrian traffic only, except for the free trolley buses which would occasionally whizz by. This area stretched for several blocks and was chock full of restaurants and shops of all descriptions, street performers, bicycle rickshaws, and teeming with people like ourselves out to enjoy a perfect early autumn evening in the city. In hindsight, we should have stayed in the area and had dinner in one of those fine restaurants that we saw. A couple of them looked particularly inviting, with menus posted outside and reasonably priced. So why didn’t we do that? I have to take the blame for this decision. Irina was more than willing but I wanted to stick to our plan. On the entire trip, the only restaurant visit we had pre-planned was in Denver to a place called Casa Bonita. A friend had told us about it, it sounded interesting and so we wanted to check it out. Of course we all know there are times when you should stick to your agenda, and times when you should be spontaneous and wing it. The trick is knowing beforehand which of these options to choose. In this case, we should have winged it. Instead, we returned to our car and headed west, again on Colfax Avenue, for another long, stoplight-filled drive, this time in the dark. Eventually we found Casa Bonita in a nondescript, mostly vacant strip mall. Despite the abandoned surroundings, the restaurant itself looked promising on the outside, built in the style of an old Spanish mission complete with bell tower, and a large, flower-rimmed fountain outside the entrance. Stepping inside, it started to go downhill pretty fast. The first thing that greets you is a chlorine smell akin to that of a public swimming pool, which is fine if I’m going to swim laps but not the best olfactory accompaniment to a meal. The smell is courtesy of one of the restaurant’s main attractions, a pool located in the center of the high-ceilinged dining area with patrons seated on two levels arranged in a semi-circle around it. The pool features a waterfall decorated in a tropical motif, with teenaged staff doing occasional dives from various heights into the pool below as part of the entertainment. That was fine, but we’d come mainly for what we hoped would be a great dinner, not for a floor show. Wrong. We realized soon after entering that this is a place intended more for an “experience” than good cuisine. Both my wife and I love Mexican food, but this has to rank as the second worst meal we’ve ever had in a Mexican restaurant, and we’ve tried a lot of them. The problems started when we first came in and were shuttled into a cafeteria type line where you grab a plastic tray and order your dinner from an extremely limited selection of dishes. We should have cut and run right there, and we seriously contemplated it. But we’d come a long way, didn’t want to return to downtown and try to find another parking place and a restaurant in the dark, yadda yadda. In about two minutes one of the staff plopped our dinner on our trays, so it’s all pre-cooked fast food style. Then, carrying our own trays, we were led by another staff member around a corner and up a long, sloping ramp to a table and told our drinks would arrive shortly. They didn’t come until we were half finished with our food, and then only after I complained to someone. Our table was not cleaned off well from the previous diners, there was food on the floor everywhere around us, and Irina’s fork was dirty. Did I mention the guy in a gorilla suit who ran around jumping over tables and high-fiving everyone like some some missing link on amphetamines? I’m not making this up. There was also a stage show featuring teenagers in safari garb doing painfully broad and inept juvenile skits with the most garbled and largely inaudible audio setup I’ve ever heard. What we now realize, of course, is that Casa Bonita is heavily geared to kids. I’m sure if I was ten or twelve years old this would be the coolest place I’d ever been in my life and I wouldn’t give a whit about the bland, overpriced food or crummy service. For us, though, not so cool.